A chance to visit the oldest science center in the state of Arkansas was not something we planned to miss. While the Museum of Discovery was relocated to their current River Market location in 1998, they have existed since their founding in 1927. With its location being in the heart of the area we were staying, it made for an easy walk from our hotel. The museum is located in a section of the city that is filled with unique attractions, shopping, and dining options. It’s kind of a one-stop shop for fun. We want to thank the Little Rock CVB and the Museum of Discovery for their hospitality. Rest assured that all opinions are our own. After checking in at the entrance, we made our way into the museum. One of our first sights was this placard stating their mission. We have had the pleasure of visiting many science centers, and will usually find plenty of interesting exhibits assembled throughout the facilities. Each location puts their own spin on the experience, which helps keep each visit fresh. For quite a while there has been a push for S.T.E.M. (Science, Technology, Engineering, and Math) training for children. Recently, we have seen it revised to S.T.E.A.M. to include the arts into the mix. We like this addition, as too many states have seen a reduction in funding for art programs in schools. As we moved into the start of the exhibits, it was hard not to begin feeling a little giddy at the chance to engage with all of the interactive displays. Yeah, we know these places are designed for kids. The truth is that most of us adults are just looking for an excuse to spend a little time playing around like we used to. Science centers are an excellent opportunity to do that, in the name of scientific exploration. 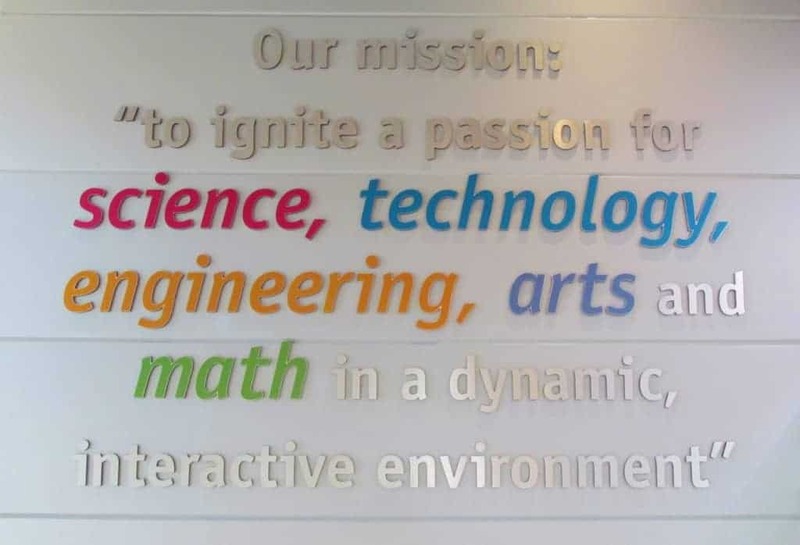 Sure, we are helping our kids learn basic scientific principles, but isn’t it better doing it in a brightly colored building filled with really cool toys? By the way, it’s hard for us to use the excuse that we are helping our kids, when it’s just the two of us. Instead, we use the excuse that we are doing research for an article. In the end, we still get to play with the cool toys! There are way too many exhibits to show off in one article. The Museum of Discovery was awarded a grant in 2011 that allowed them to add an additional 90 new exhibits to their ever growing collection. Like all of the other kids, we bounced from one display to the next. Each one is designed to teach the basics of a scientific principle, but in a way that makes learning fun. The one pictured above using a pendulum to draw a design on a piece of paper. The user will set the counterweights at a certain height and this will cause the movement to be unique to the combination. In the end, you can walk away with your own piece of art that was created by your settings. This is a popular exhibit. 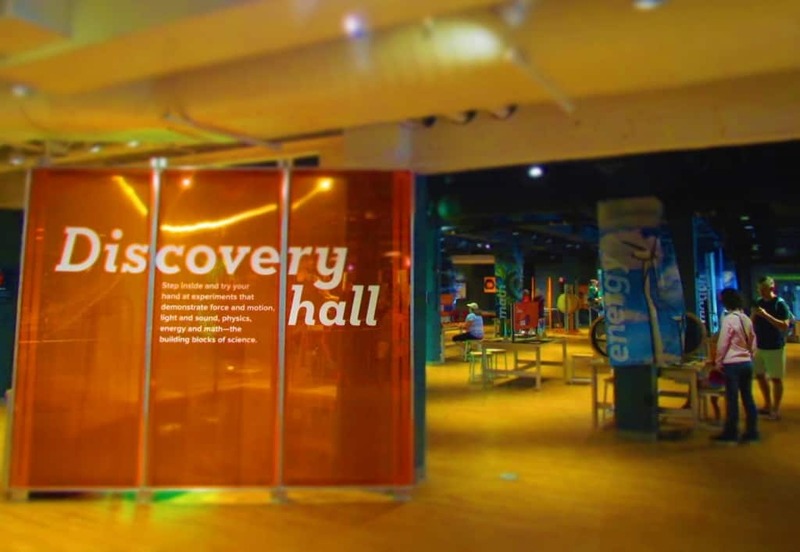 One thing we noticed at the Museum of Discovery was how engaged the staff is with guests. Throughout the day they would hold demonstrations, which showed off interesting scientific experiments. These were announced, so that visitors would have time to assemble, if they desired. During one demo, we watched a staff member create a fire tornado. These quick lessons were entertaining for kids and adults alike. At some point during our visit, we moved into the Amazing You section of the museum. This area is dedicated to teach visitors about the body. 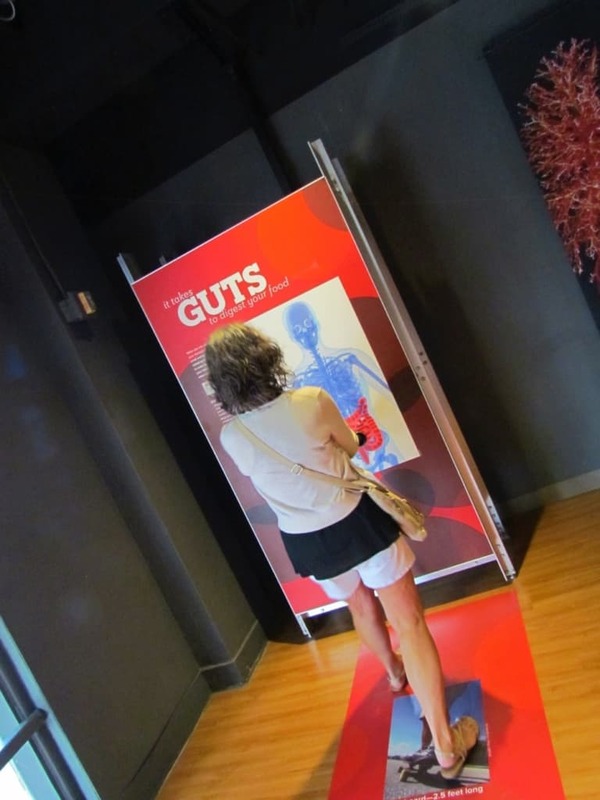 It has a wide variety of interactive displays that feature just about every organ inside a human. This was another opportunity to learn in a fun way. One of the first displays we saw, was designed to challenge two people to see who could lower their brain activity to the lowest level. We had only seen this exhibit once before, and it is rather amusing to watch. The idea is that a ball is set on a pathway between the two contestants. They strap bands to their heads, which measure the amount of brain activity. The more activity, the more it will force the ball away from you. The idea is to relax your mind, so that the ball will roll to your side. What we always notice is that when the ball gets close to one side, that person gets anxious to win, which triggers higher brain activity. I’m pretty sure I would fail at this game, since I struggle getting my mind to slow down when I try to sleep. How do you think you would do at this game? 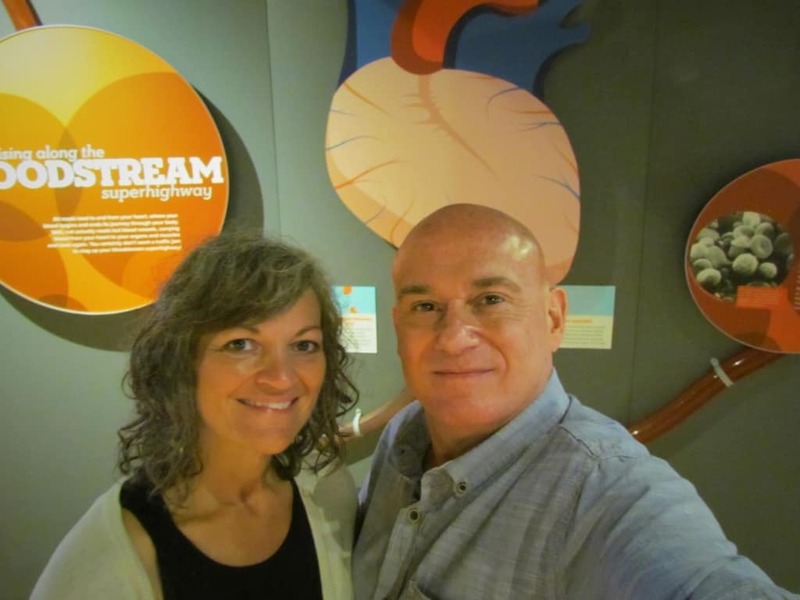 Crystal found an interesting exhibit, which focuses on the intestines. Many of you are probably aware that we have a lot of intestines packed into our digestive tract. While we are certain that they covered this in one of our school science classes, there is certainly something to be said for a visual display. After reading the information on the placard, it instructs you to pull the rope to see how much length you have in the average digestive tract. It really hits home to see Crystal keep pulling and pulling. 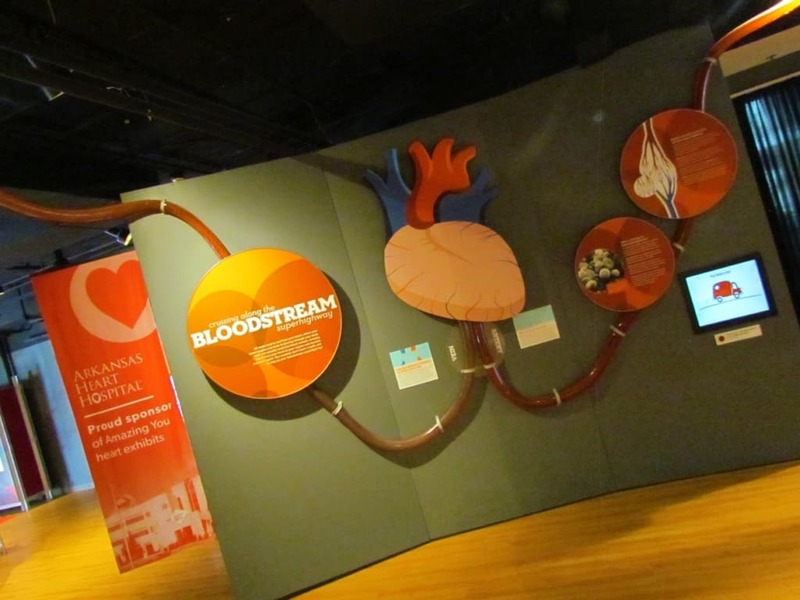 We really find this type of hands-on exhibit to be some of the most educational, as they open our eyes to the reality of something that affects every one of us. 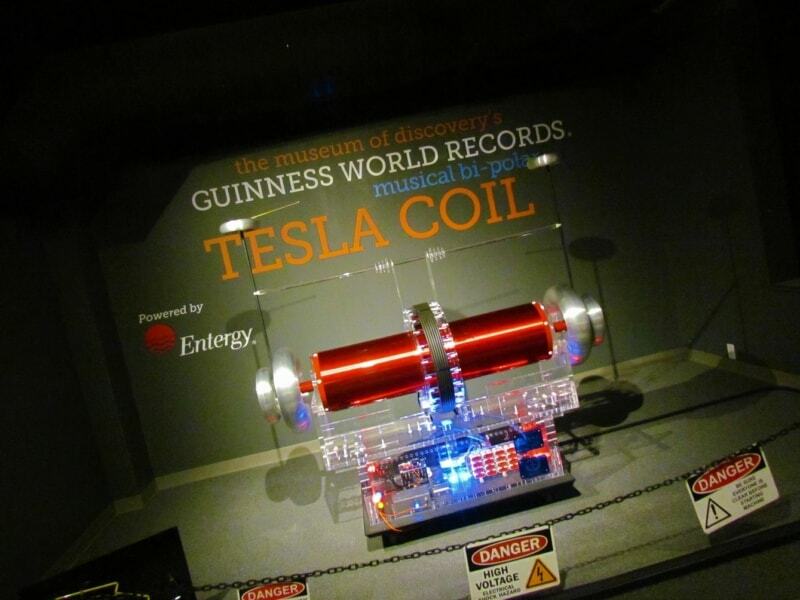 For us science geeks, the opportunity to see a Tesla Coil is always interesting. We have had the opportunity to see a few during our travels. What surprised us was that the Museum of Discovery has a musical version, and it’s the world’s largest. They have performances periodically throughout the day, which cost just two dollars for non-members. The half hour show is well worth the price, as where else can you see this type of entertainment. Staff can adjust the frequency of the electrical display to play musical notes. We were amazed at this display! There is still way more exhibits that we have not covered in this article. The Tornado Alley Theater is a multi-sensory display on the devastating tornado that ripped through Little Rock in 1999. Room To Grow is a space designed for museum visitors 6 and under. Here we saw kids practicing their veterinarian skills, performing in a dance studio, and scrambling on an oversize climbing structure. The Tinkering Studio offers guests a space to be the next great inventor. With an assortment of tools and materials, you can create a variety of projects. Staff is often showcasing a specific design that will teach some basic scientific principles. With so much to see and do, you will definitely want to reserve at least a half day for your visit. The Museum of Discovery is an attraction where you will certainly get your money’s worth of educational fun. Share this with your science loving friends! 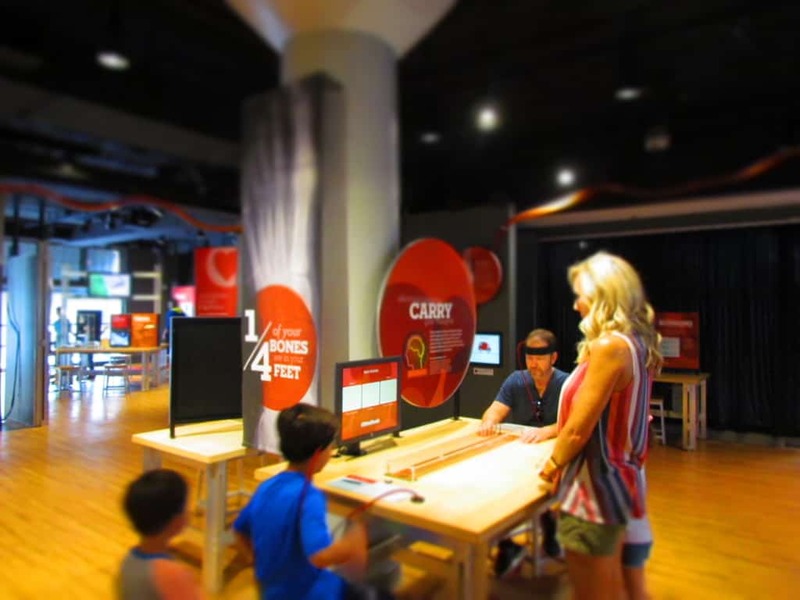 The Museum of Discovery looks like a great way to discover Arkansas and the world! Thx so much for introducing us to this amazing venue. Love all those interactive displays that teach basics in science. Thanks for the video. My first time. Glad you enjoyed it. We are just wetting our feet in the video world. Henk would be all over this, as he’s the nerdy geek in the family! 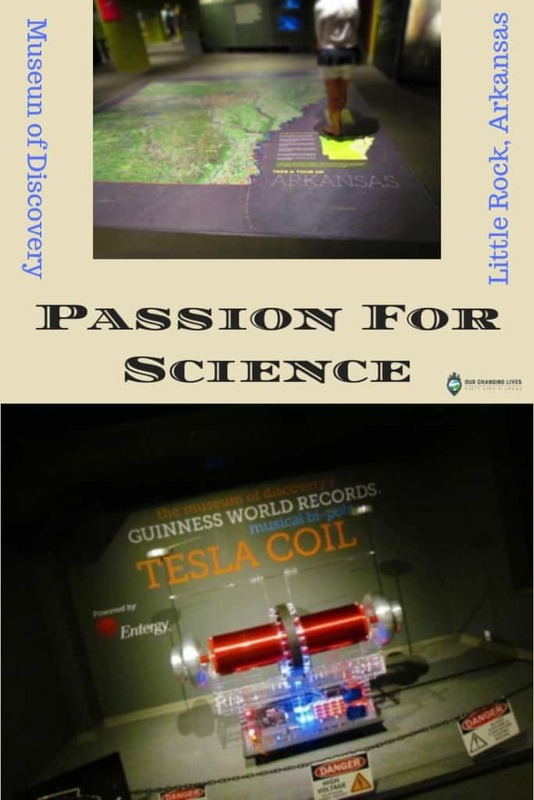 We love going to Science Centers and this one in Arkansas looks like a fun one. 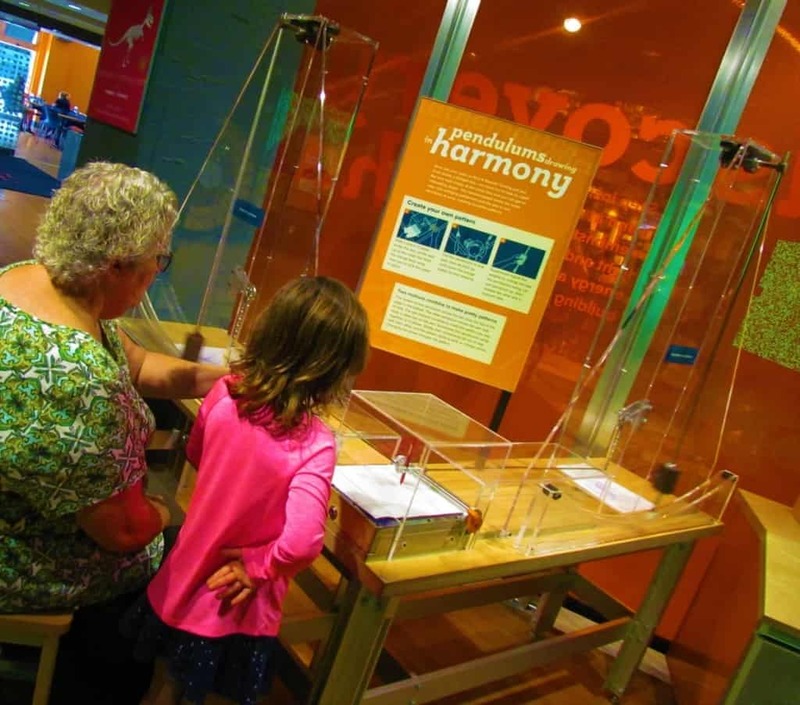 Hands on exhibits are a great way of getting kids (and adults!) interested in science. And I’m so pleased that they’re incorporating the arts – creativity is essential for scientific innovation. So true. We were happy to see the arts addition, as well. So happy to see this type of museum that stresses the importance of science. This one looks like it is very interesting and I love that they have so many interactive exhibits for young and big kids alike. Thanks for visiting our site. Glad to hear you support the sciences.